It is my privilege to introduce the gallery presented by Maxine Nelson which honors the deeply moving installation created by Kamila Ženatá in Prague and in the concentration camp Terezin. I also saw this work when I was in Prague for the International Psychoanalytic Association Meeting. The impact of the work was visceral. Words were not needed to feel the depth of the work. What is more fundamental and human than laundry? Particularly bed sheets. In addition, the artist wrote about the personal dimension of this work. What is it about this work that is so fundamental and so absorbing? When I saw the work it was seared in my mind and remains there. I think that it is a work that captures trauma and resilience at a visceral level deep in the body. While it is profoundly intelligent it touches at a deeper level of pure feeling. The laundry, the empty rooms, the crystal tears all speak to our souls. Kamila Ženatá has transformed and symbolized very personal trauma. Maxine Nelson has communicated her deeply felt reaction to engage us as witnesses. 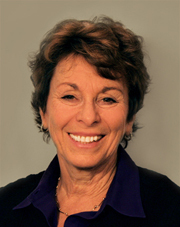 Marilyn B. Meyers, Ph.D. is on the faculty of the Washington School of Psychiatry, where she teaches and supervises in the post graduate Clinical Program on Psychotherapy Practice. She is past-chair of the Clinical Program and Chair of Admissions. She is past-president of the Section on Couples and Families of the Division of Psyhoanalysis (39) of the American Psychological Association. She is co-editor and co-author with Dr. Nancy Goodman of The Power of Witnessing: Reflections, Reverberations and Traces of the Holocaust (Trauma, Psychoanalysis and the Living Mind), (Routledge, 2012). Her other publications include: “When the Holocaust Haunts the Couple: Hope Guilt and Survival in Psychoanalytic Perspectives on Couple Work, 2005, and “Am I my Mother’s Keeper? ; Certain Vicissitudes in the Mother-Daughter Relationship Concerning Envy” in The Mother-Daughter Relationship (Jason Aronson, 2008). She is particularly interested in the effects of relational trauma on attachment throughout life. In addition she has presented papers inter nationally on the use of film to illustrate the aftermath of massive trauma and the inter-generational transmission of Holocaust trauma. She maintains a private practice in Bethesda, MD.